Submitted by kimeats on March 13, 2015 – 10:10am. You can see the recipe here http://www.weekendbakery.com/posts/our-version-of-tartine-style-bread/ but I will outline them below. I used my starter fed with KA WW. For the bread flour I used a mix of KA Bread flour and a locally milled wheat bread flour that still has some chunks of bran left in it. KA WW was used for the ww portion. Made the poolish, and left it at room temp for 12 hours. Added the other ingredients except for the salt and water part 2 and left to autolyse for about 20 minutes. Then added the salt and the small amount of water (part 2). Left to rest 30 mins then do 6 stretch and folds every 30 minutes. 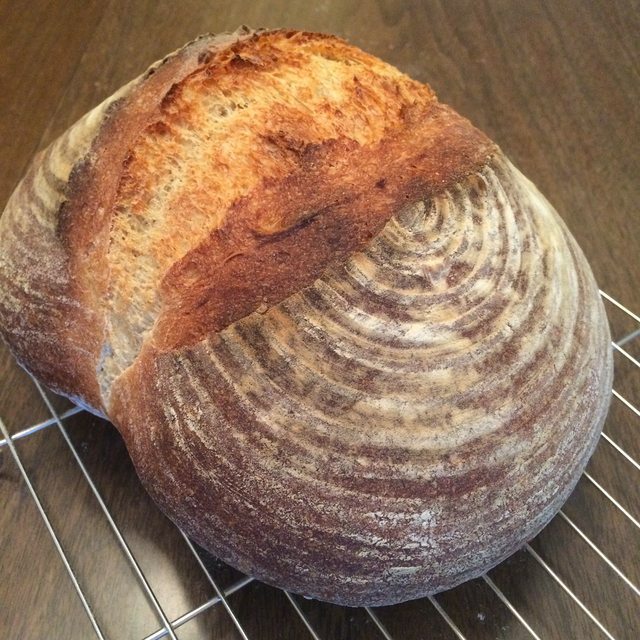 I shaped it into a boule and put it in a proofing basket for 2.5 hours until it passed the poke test. Preheated oven at 465F and set up a crude steam. Slashed loaf. The recipe called for baking this 45 mins in a 445F oven. Mine only went about 22 minutes. 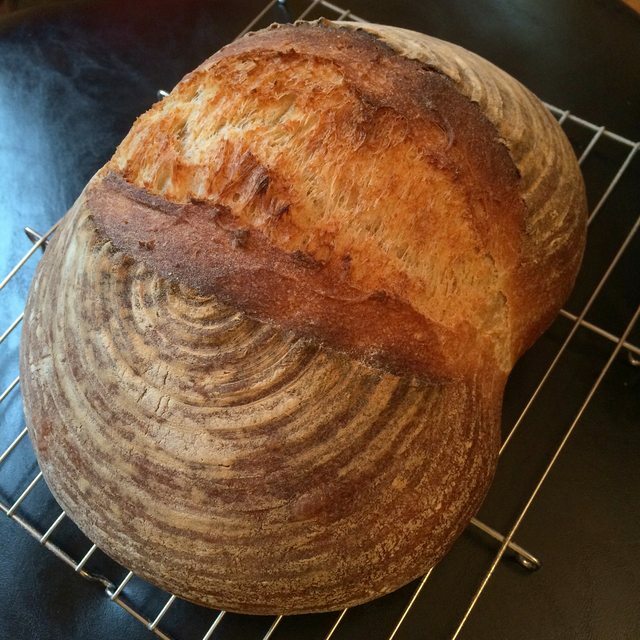 I baked the loaf on a preheated baking steel I keep in the oven as this is where i bake everything. It had a nice airy holy crumb and worked well.